Being a member of the Indian fashion fraternity, I have been attending the Lakmé Fashion Week since its earliest days. First as a fashion student, helping out with backstage activates, then as a part of a participating designer’s team, later as an industry member and since the last 2 seasons as a fashion blogger. While attending fashion week is not a new thing, covering it as a blogger has been an altogether new experience. It changes your perception and you start to see the entire fashion week with a fresh set of eyes. Since I have already live tweeted my heart out my views about most of the collections, which pieces I loved, industry news, gossip and the infamous fashion week #overheard, this time round I wanted to cover Lakmé Fashion Week a little differently. 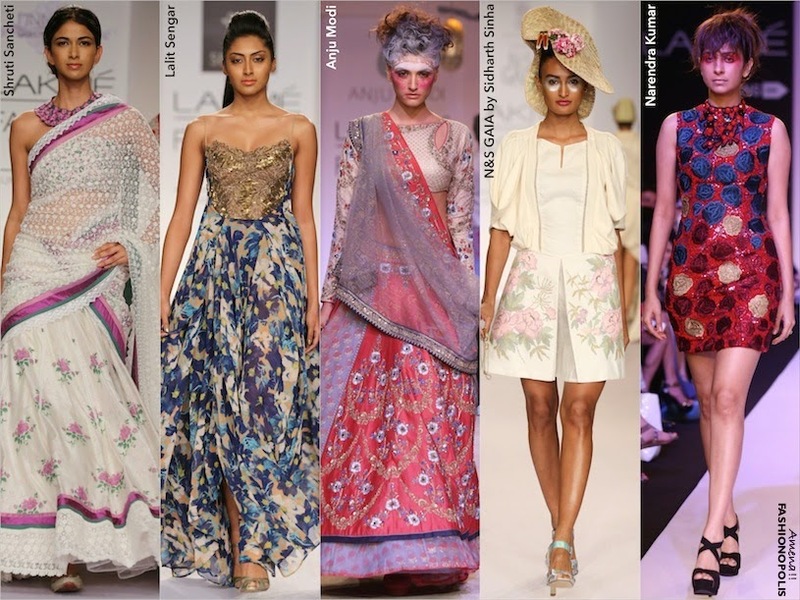 Instead of a generic rundown of the collections I decided to highlight the top 10 trends seen at Lakmé Fashion Week Summer/Resort 2014. Hands down the most identifiable of Spring-Summer 2014 trends, art is having a major fashion movement! From bold brush stroke splashes to paint swirls, photography to graffiti, pop art prints, murals and architecture, all things art has been leaving its colourful impact across the fashion world. Staying on trend, different forms of art techniques made their appearance all through LFW S/R 2014. Indian miniature paintings from 16-19 centuries played muse for Aartivijay Gupta’s collection. Portraits, court scenes, flora and fauna along with Haridas, Tansen and Akbar relaxing in Vrindavan and Ragamala paintings, created a visual story of India’s golden eras. While Aartivijay found inspiration in India's history, Narendra Kumar turned to the works of American abstract artist, Franz Kline's paintings and Sounia Gohil’s European Renaissance theme collection saw beautiful digital prints of European decor. From the looks of it, fashion world seems to be crushing on all things sports! Possibly the easiest trend to experiment with, the focus is on sportswear basics reinvented in luxe materials. Key pieces are silky sweatshirt, varsity tees, sporty broad stripes, sneakers, numerical motifs, pleated skirts and anything in sporty silhouettes. 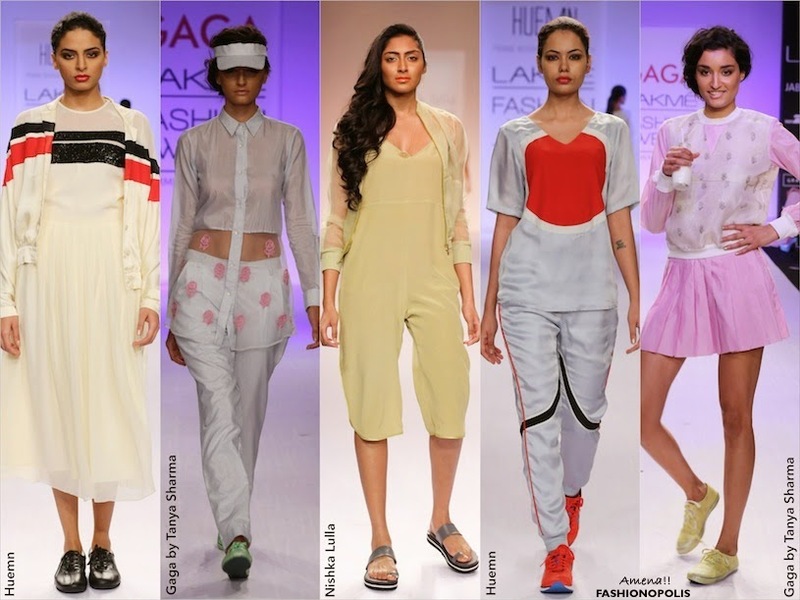 Huemn by Pranav Mishra and Shyma Shetty was the perfect balance of luxury and sporty comfy. GaGa by Tanya Sharma showcased “Out of the Box”, edgy at the same time feminine pieces for the adventurous woman. 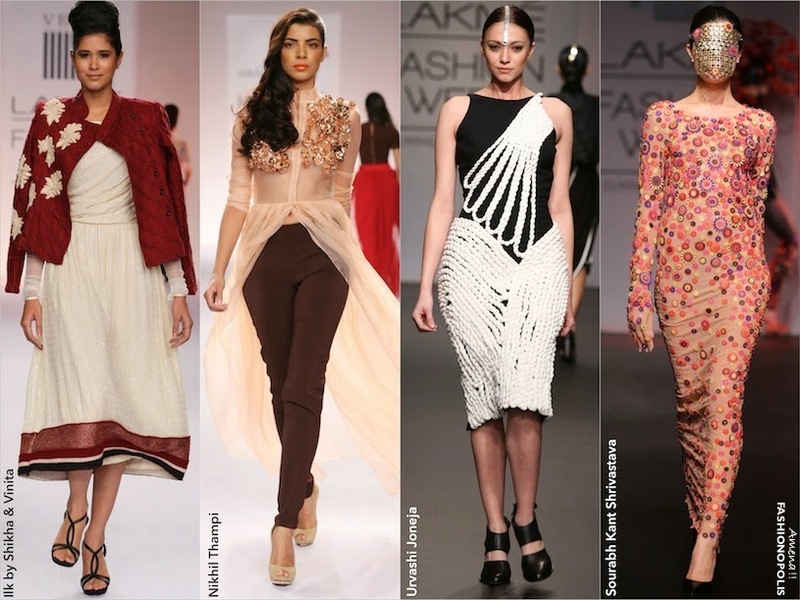 Nishka Lulla offered easy-to-wear, fuss free clothes, for the globetrotting fashionista. The motto of this trend is, keep it simply, sporty and chic! Surface ornamentation and Indian fashion go together like two peas in a pod. The chances of seeing a collection devoid of any form of surface ornamentation, embellishment or embroidery is slim to nil. However, this season of Lakmé Fashion Week, designers have taken surface ornamentation to new dimension. Giving a miss to the run-of-the-mill embroidery and embellishment, designers have opted to offer larger than life 3D surface ornamentation. Nikhil Thampi decided to decorate his well-tailored, structured pieces with 3D gold metallic flowers. Sourabh Kant Shrivastava's “Rebirth in Kaliyug” saw embellishments in the form of acrylic floral motifs and metal trimmings and Urvashi Joneja twisted yards of fabrics to make cords that has been used as an embellishment along with leather cutwork flowers. Step aside monochrome, there is a new pair in town! And from the looks of it they are quite a popular duo. 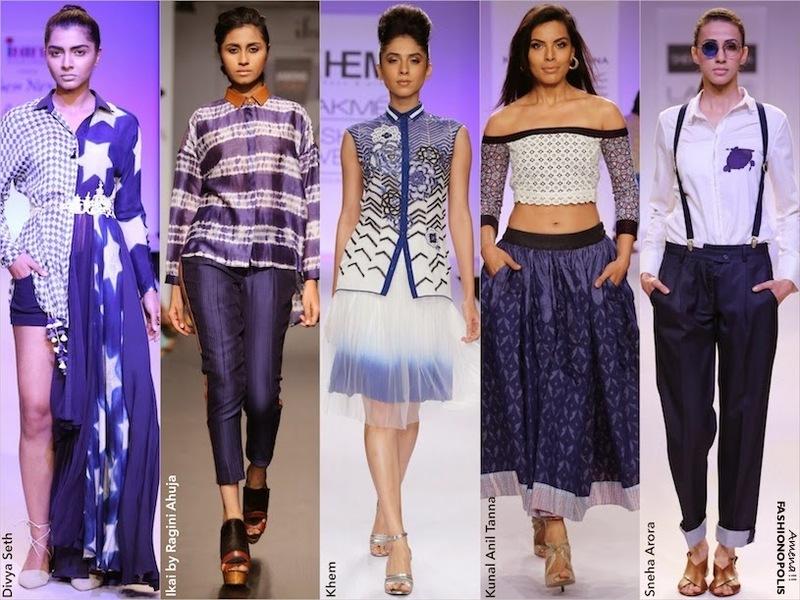 While the blue and white combo dominated at Divya Seth and Khem, the duo made its presence felt at Shehla Khan, Kunal Anil Tanna, Sneha Arora and Ikai by Ragini Ahuja. From Ajrakh prints with the unusual clamp dyeing motifs at Divya Seth to navy ombré effect and floral embroidery motif at Khem to tie-dye detailing at Ikai by Ragini Ahuja, the colour combo has been displayed in myriads of styles and techniques. They may not be groundbreaking, but floral will forever be considered the epitome of summer. Even though it is a regular spring-summer trend, it never fails make an impact. And lets be honest, what is summer fashion without its share of full blooms! N&S GAIA by Sidharth Sinha managed to beautifully blend traditional hand-woven textiles of Meghalaya and crafts of Northeast India with delicate floral motifs. 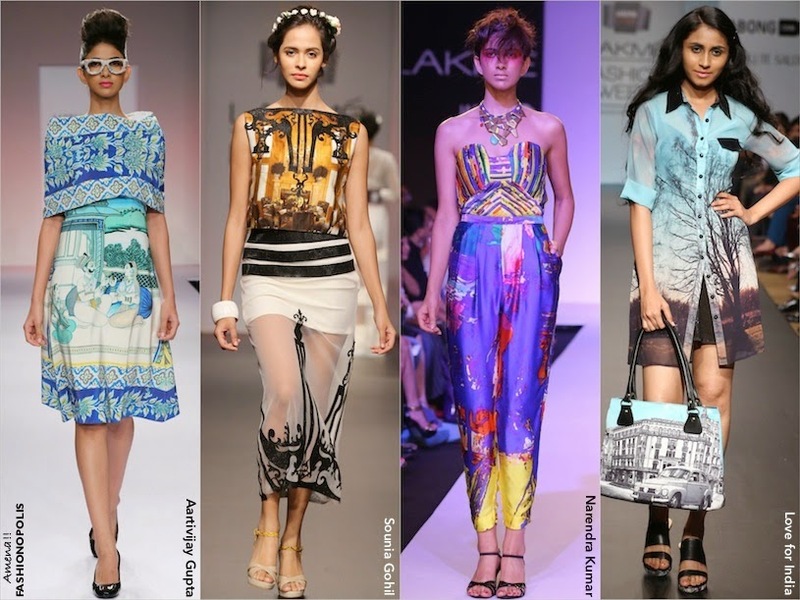 Which of these top 5 Lakmé Fashion Week Summer/Resort 2014 trends you can’t wait to try this season? Do share your thoughts with me in the comment section. Awesome post Amena..m totally crushing over the haute hues..blue n white. Great post! Love the blue and white! So chic! Its a great analysis. Good to read some knowledgeable content. Love the art attack trend!